It just keeps getting better. Week three of The Starter League has been the best so far, after the amazing first two weeks I didn’t think it could get any better. This week we started to play with rails! O man, learning to code is sooo much fun! I love the fact that I walk away after each class having learned something new. The idea is that we cover something new in class, and we get to do it once in our pairs in class. Then after class, you try and do the example from class by yourself, referring to the solution when you get stuck. You continue to practice this until you can complete it without looking at the solution. Once you get there, you try and do what we learned in class on your own app or idea. Since I didn’t really have an app or idea that I wanted to work on I had to come up with something. 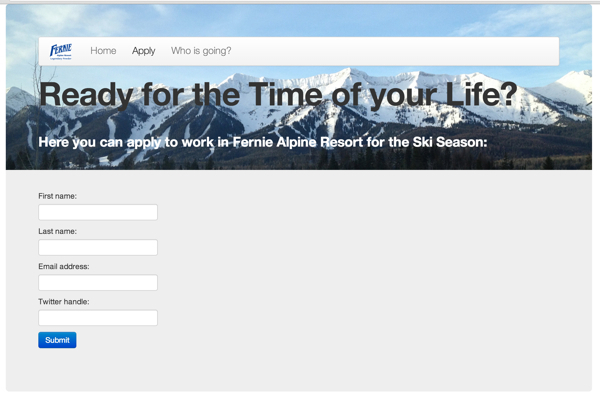 So, since I am trying to get a job as a ski instructor in Fernie, I thought let me try and build an app for helping them recruit seasonal workers. Here you apply in my new rails app, it will enter your details into the database. So this week we were introduced to rails. Rails is pretty cool, it makes life allot easier and it allowed us to set up the skeleton for a web app in no time. It also makes talking to a database really easy. 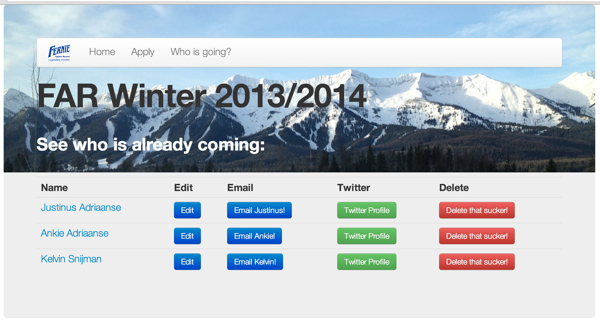 So my FAR (Fernie Alpine Resort) recruiting app became my first rails built, database backed app. The data for this list result page is pulled out of the database in my first rails app. It is actually amazing how much we’ve learnt in only three weeks. While building out my FAR recruiting app I got to do a few things for the first time. I used bootstrap to help me with styling and used rails to set it all up. I set my own database for the first time and interacted with it. They call it CRUD – Create, Read, Update and Delete. Basically the actions you perform while interacting with a database. I am having so much fun! Still can’t believe I didn’t do this a long time ago. The more I enjoy this, the more I think I want to be a hacker! This entry was posted in Coding, Starter League on 2013/07/22 by Justinus.